By all accounts, the Building & Construction Industry is experiencing a significant downturn. These financial pressures have resulted in job cuts, substantial debts and in many instances, corporate collapses. 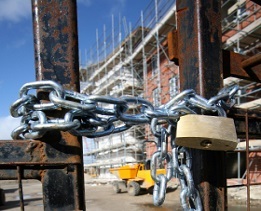 In recent years a high percentage of companies that have been wound up were within the Building & Construction Industry. The question that many are now asking is how can I prevent this from happening to my business? 1. Carefully selecting the companies that you do business with. This will require a consideration of factors such as the company’s reputation, their perceived ability to pay, their size and corporate structure. 2. Ensuring that your work is subject to a written Contract with clear Terms & Conditions. This is crucial. A Contract should set out when payment is due and what will happen in the event your client fails to pay your invoice. 3. Obtaining advice on Contracts before you sign them. Generally, Contracts are drafted so that they are more favourable for the issuing party. It may be necessary to propose amendments to the Contract to improve your position under the Contract. 4. Being aware of the legislation that applies to the Contract. This will mostly be determined by the nature of the work to be performed under the Contract. Some legislation such as the Building and Construction Industry Security of Payment Act 1999 sets out procedures to be followed when seeking to recover outstanding monies. 5. Obtaining advice on whether it is appropriate to register an interest over the goods and services provided under your Contracts. This interest is registered in the Personal Property Securities Register (PPSR) and will allow you to obtain payment before other companies who have not registered their interests and those who registered at a later time. 6. Monitoring your debts and taking steps to recover the amount outstanding as soon as practicable. The steps taken will usually depend on matters such as your relationship with the debtor, the terms of the Contract, the nature of the job, the amount of the debt and the applicable legislation. 7. Managing the credit limits allowed to clients and terminating or reducing credit limits where appropriate. 8. Consulting with a financial advisor and accountant. Contact our Commercial Litigation Team today to discuss how we can help you implement these strategies.